Prem International Agri Services Pvt Ltd. The natural sesame seed undergoes an initial screening and thorough cleaning, assuring a clean seed ready for hulling. Hulled sesame seed undergo a low temperature physical hulling during which no additives or chemicals are used. This process implies that the seed contains all its natural richness and flavor while it only loses its skin. Removal of the skin makes the seed softer and better digestible. Mechanically hulled sesame seed enriches bakery and confectionary products. it is also the basis for our creamy, sweet wholesome tahini. Our Hulled Sesame Seeds, is processed from selected Natural Sesame Seeds of GUJARAT Origin (considered to be the best among all sesame verities worldwide) going through several processing stages. For hulling purpose, we select premium grade natural sesame seed and clean it to 99.99% purity. Thus we get Bold, Uniform and Aromatic Hulled Sesame with highest purity and natural freshness. It is used in bakery & confectionery items as topping in products like burgers, bagels, crackers, bread & breadsticks. Hulled Sesame Seeds are used to make Tahini, Halvah, granola, candies and sesame bar. It is also used in various cooking dishes to enrich taste & nutritional values. 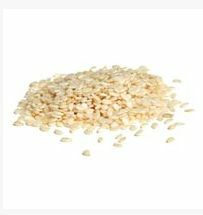 Hulled Sesame Seeds have rich proteins, vitamins, Iron, calcium, phosphorous and other important minerals. Since the skin of seeds are removed, they become easily digestible to the human body. Sesame seeds reduce cholesterol level and prevent high blood pressure in human body. Exported Mainly : Usa, Vietnam, Australia, Russia, Greece, Germany, Netherlands, Poland, Israel And Canada.